30 March 2015—On 9‒11 March 2015, the Centre for Political and Regional Studies (CPRS) at the Canadian Institute of Ukrainian Studies, University of Alberta, held a symposium on the first anniversary of the Euromaidan Revolution in Ukraine. At the symposium, scholars and experts from Canada and Ukraine spoke about the significance and consequences of this historic event and its influence on current international developments. 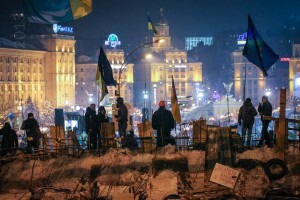 10 February 2015— In the course of the Euromaidan revolution and the subsequent military conflict with separatists and the Russian army in Donbas in 2013‒15, thousands of people—military and civilian—have been killed and hundreds of thousands displaced. The ongoing conflict also has repercussions for the European Union, the United States, Canada, and the United Nations with its role of promoting peace, security, and human welfare.